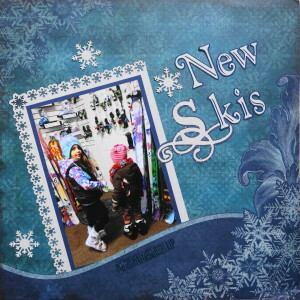 In this album you will find scrapbook ideas for Christmas and winter scrapbook pages with other snowy themes like skating, sledding, skiing, snowman and more. Inspiration: The line of soldiers in one of the photos. 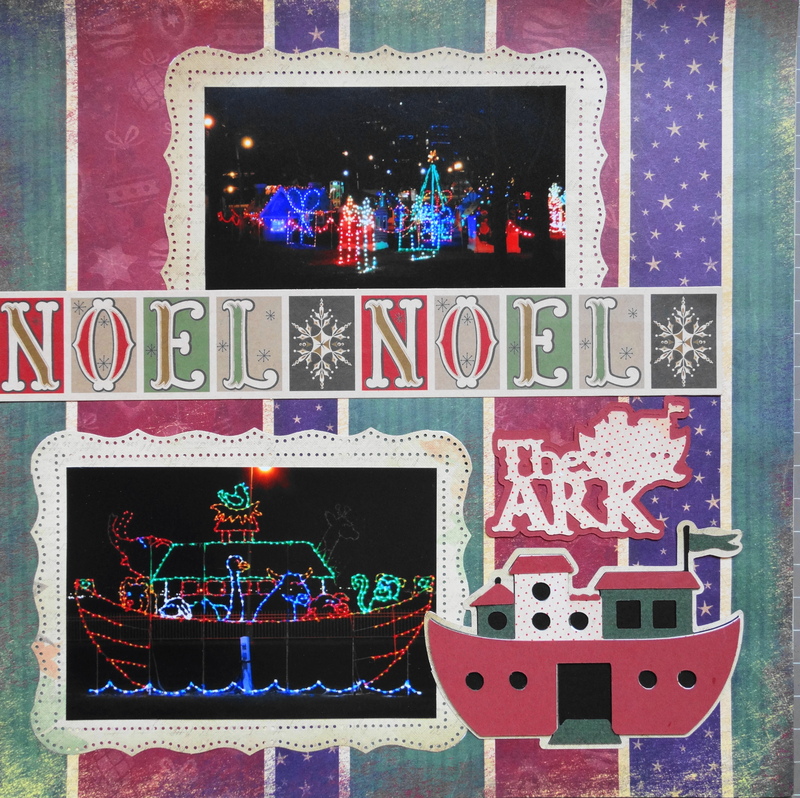 Inspiration: The nativity scene, the ark and the angels in the photos made me pick a biblical theme for this page. The Nativity scene image is from the cartridge When It’s Cold Outside. The ark and title “The Ark” are from Noah’s ABC Animals. 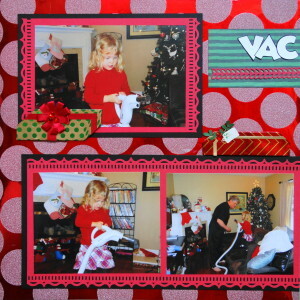 I used a cherish border punch from Martha Stewart to mat photos. 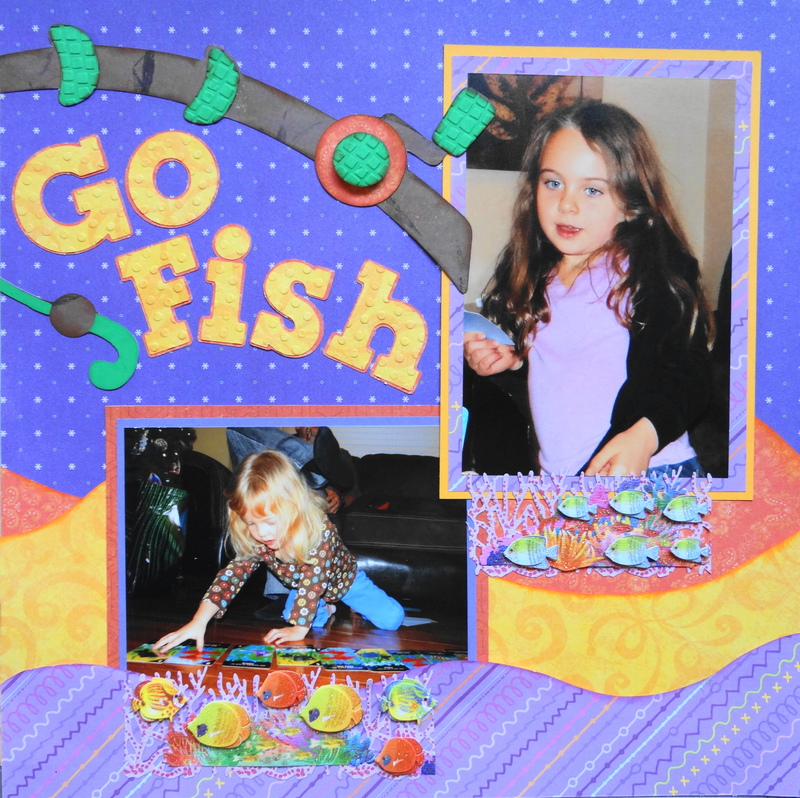 Inspiration: We are having a rousing game of Go Fish. I chose the background paper because of the colour of her top. 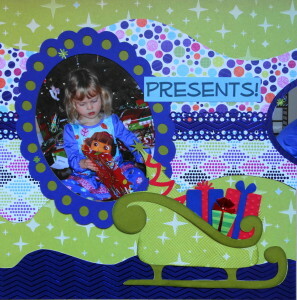 Inspiration: In her JK classroom for the Christmas concert in her purple velvet dress. 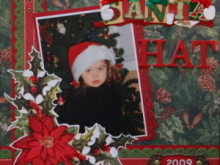 Inspiration: My granddaughter’s Christmas concert where she sings in a choir. 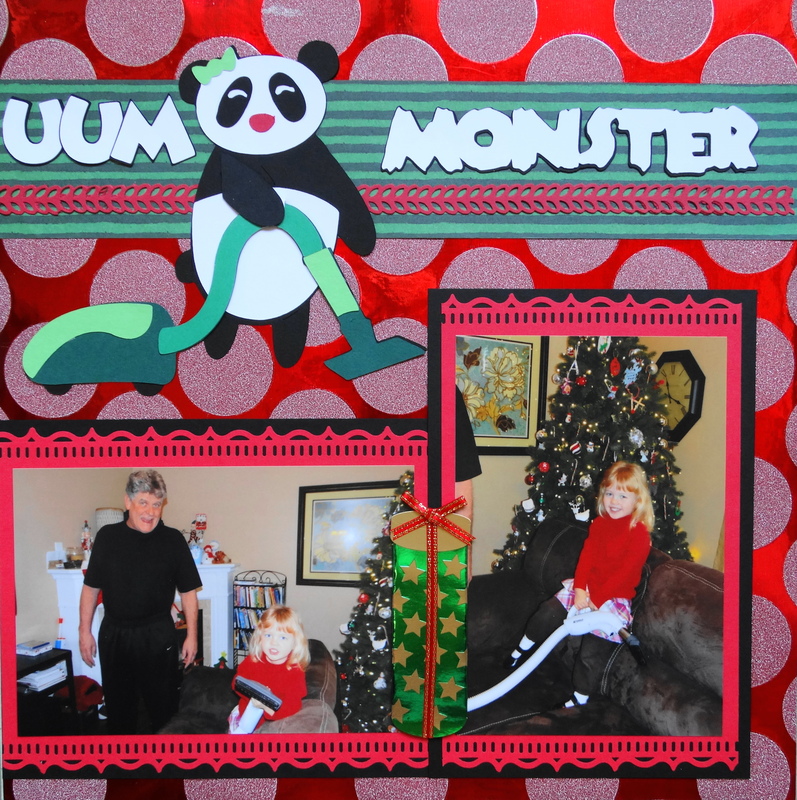 Inspiration: Helping Grampa vacuum turned into a game of Vacuum Monsters and her nickname happens to be Panda. 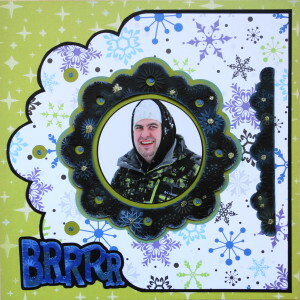 The scrapbook paper is American Craft POW Glitter Paper. The panda bear vacuuming is an image from Animal Antics. 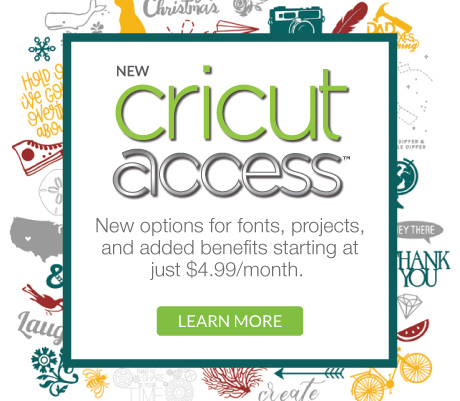 The title word “Vacuum” is from Disney Mickey Font and the word “Monster” is from A Frightful Affair. 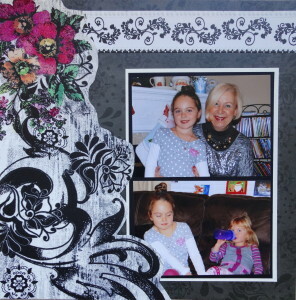 I used the Martha Stewart Flourish Lace punch to mat the photos. 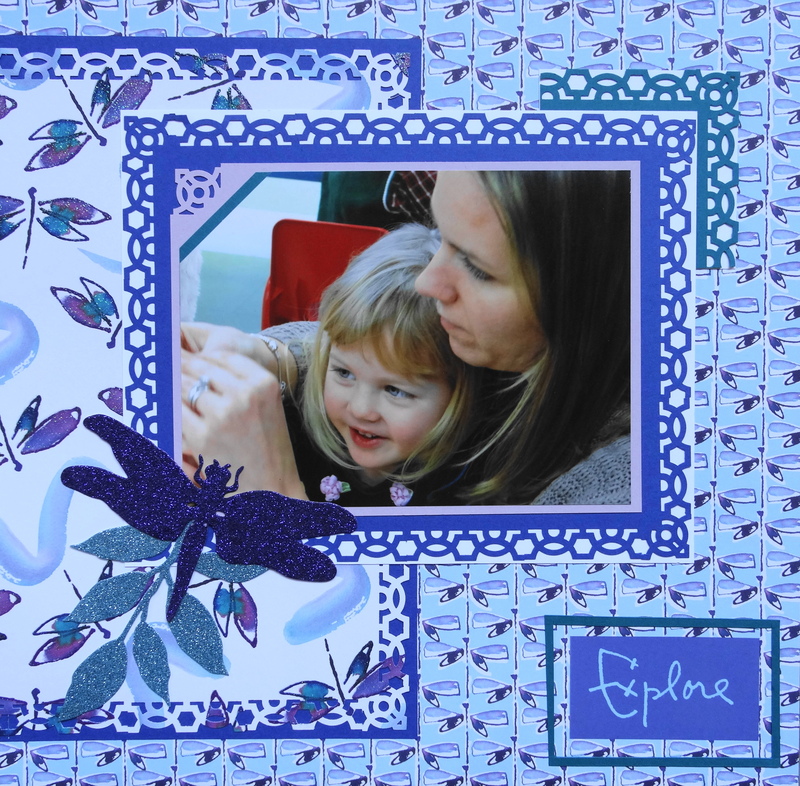 Inspiration: The pattern of her top inspired the paper selection and I picked this pattern of frame because it looks like icing for the baking theme. Inspiration: Pictures taken by the Christmas tree. 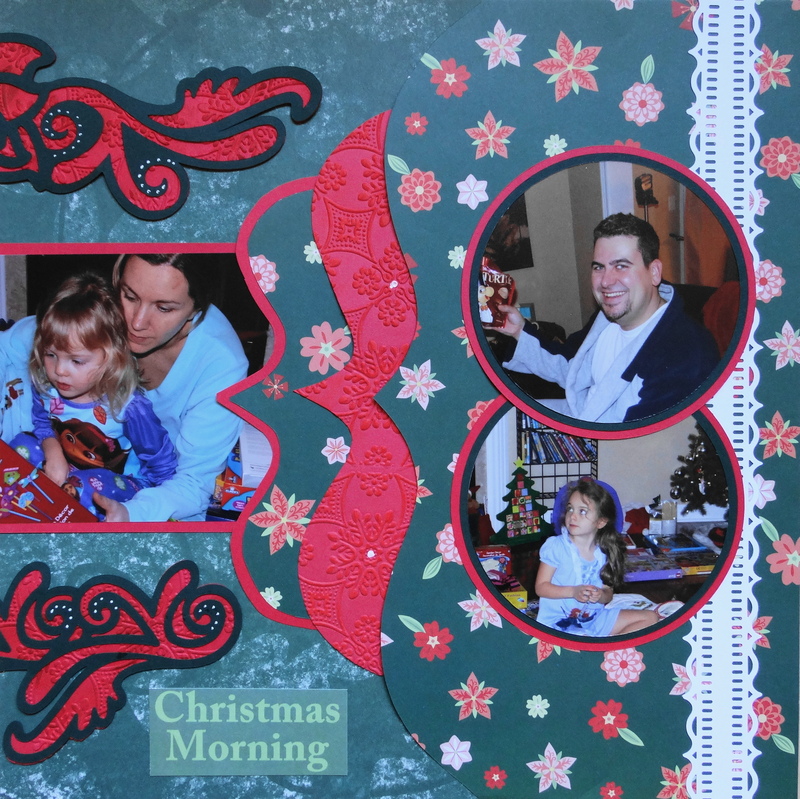 The scrapbook paper is from Creative Memories. 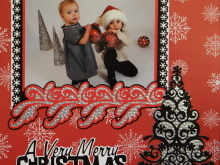 The tree and all the gifts are from Winter Wonderland. 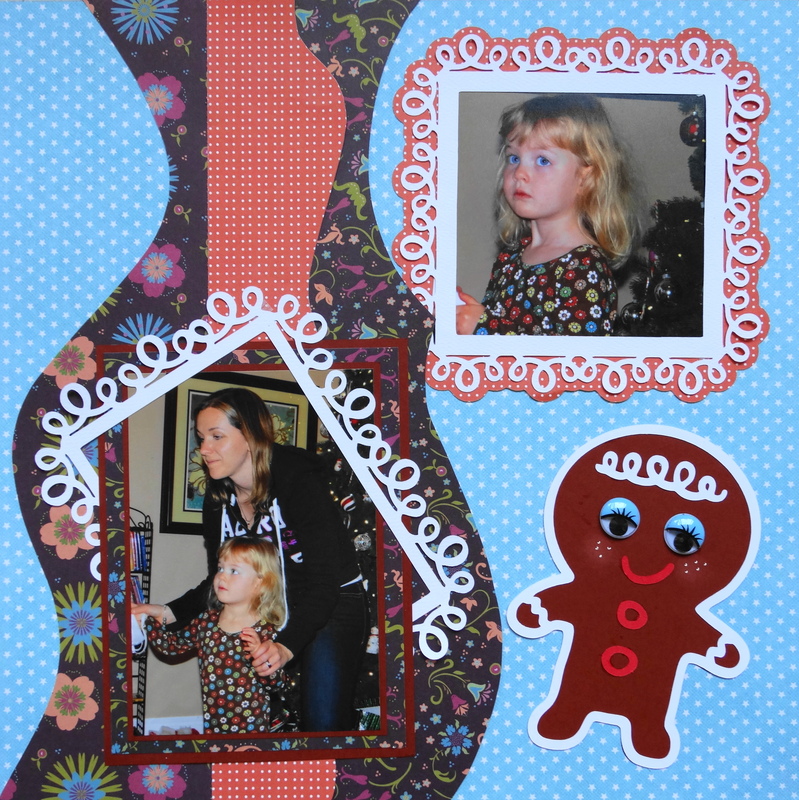 The frame is from Small Talk Tags & Frames. 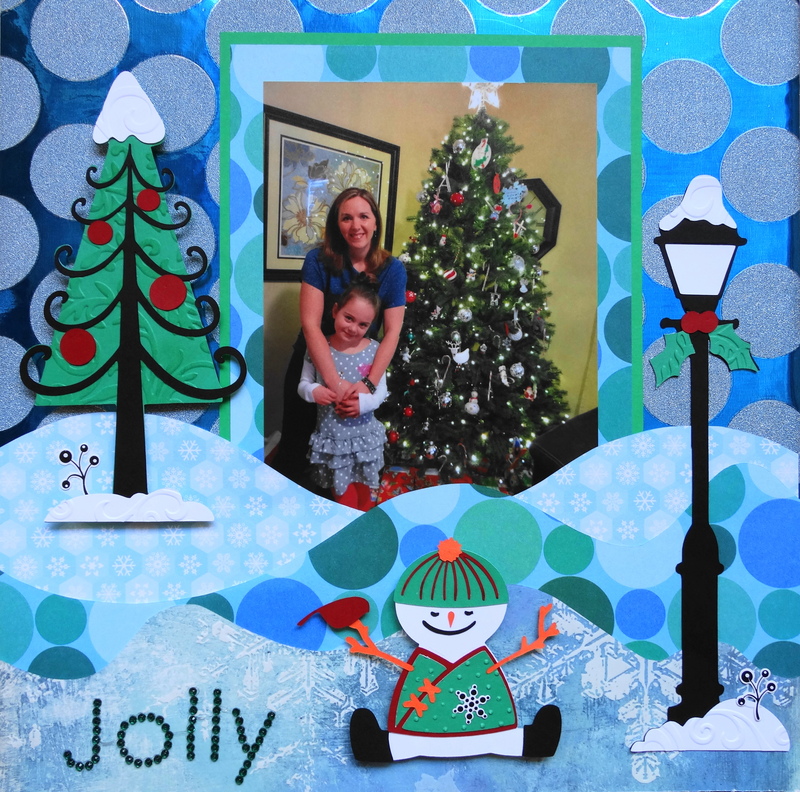 The title “Joy” is from ‘Tis the Season, a Creative Memories cartridge. Inspiration: I wonder what she is thinking of in this Christmas Eve photo. The door and the window are from Christmas Noel Solutions. The Santa and the presents are from A Quilted Christmas. 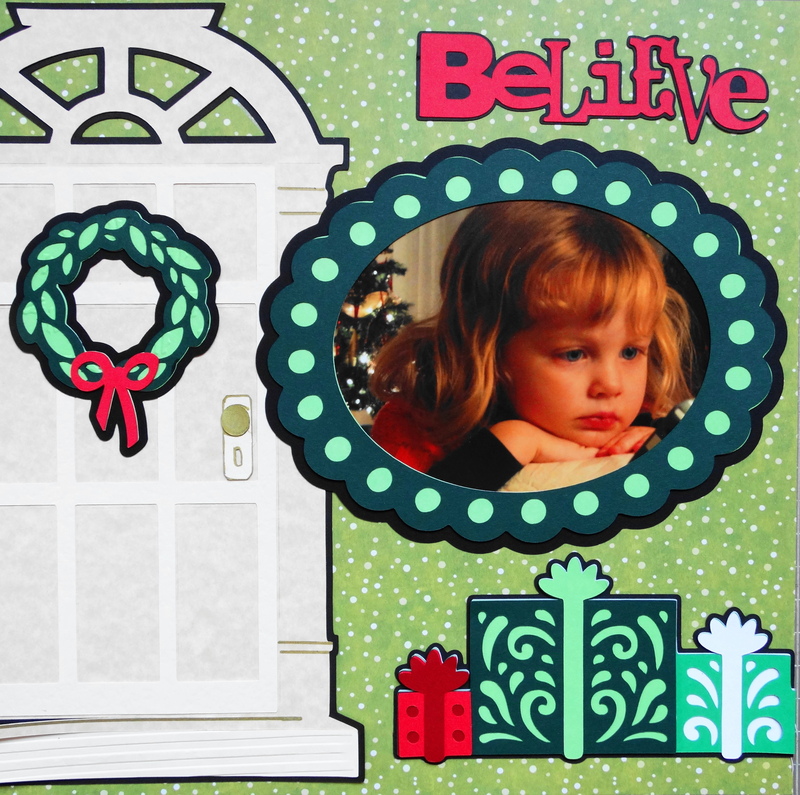 The wreath is from “Tis the Season and the title “Believe” is from Wall Decor & More. 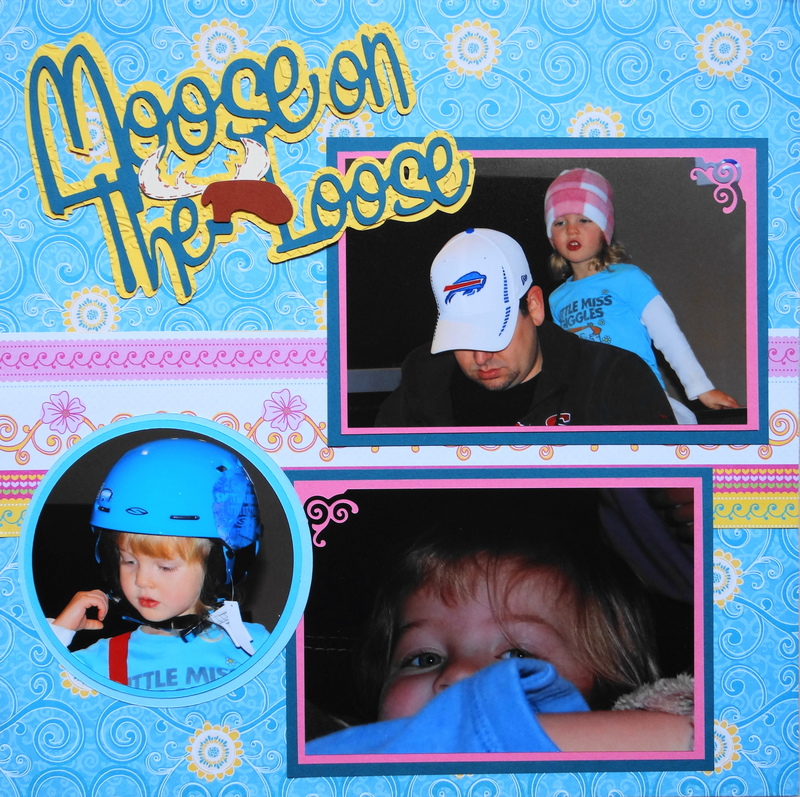 I used a Martha Stewart geometric frames border punch to mat the photos. I tried to create the impression of being inside the house on this page. 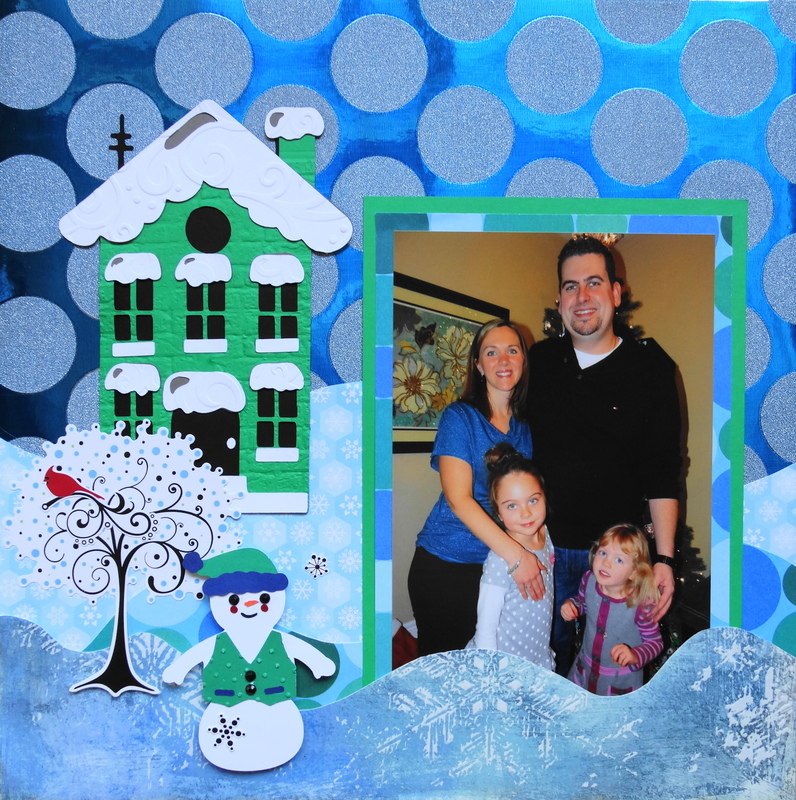 Inspiration: Her blue top inspired a winter scene for this family photo. 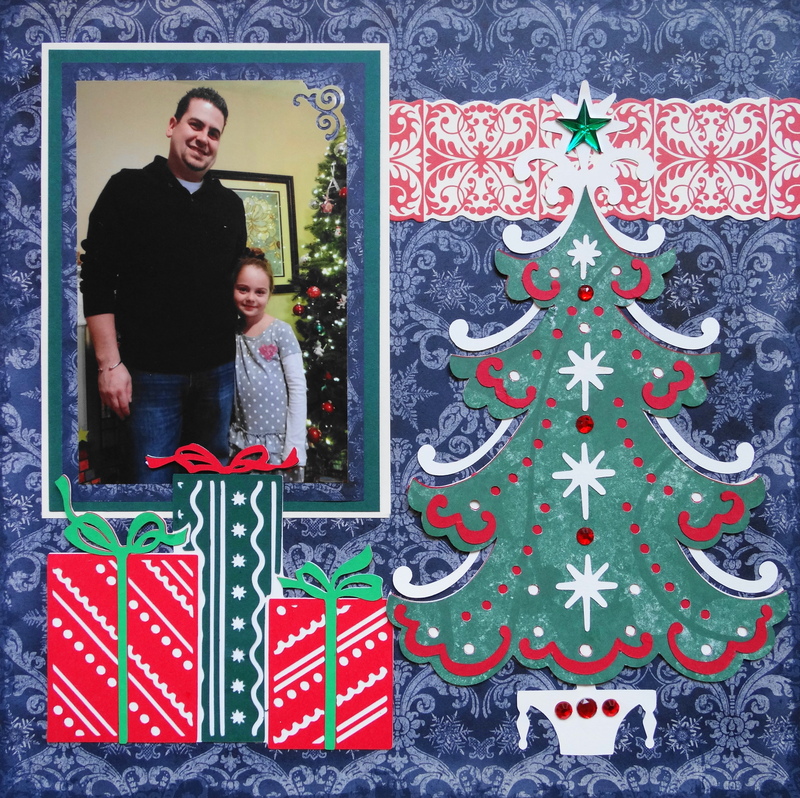 The scrapbook paper is from American Crafts POW Glitter Paper. The house, street lamp and tree are from Jolly Holiday. 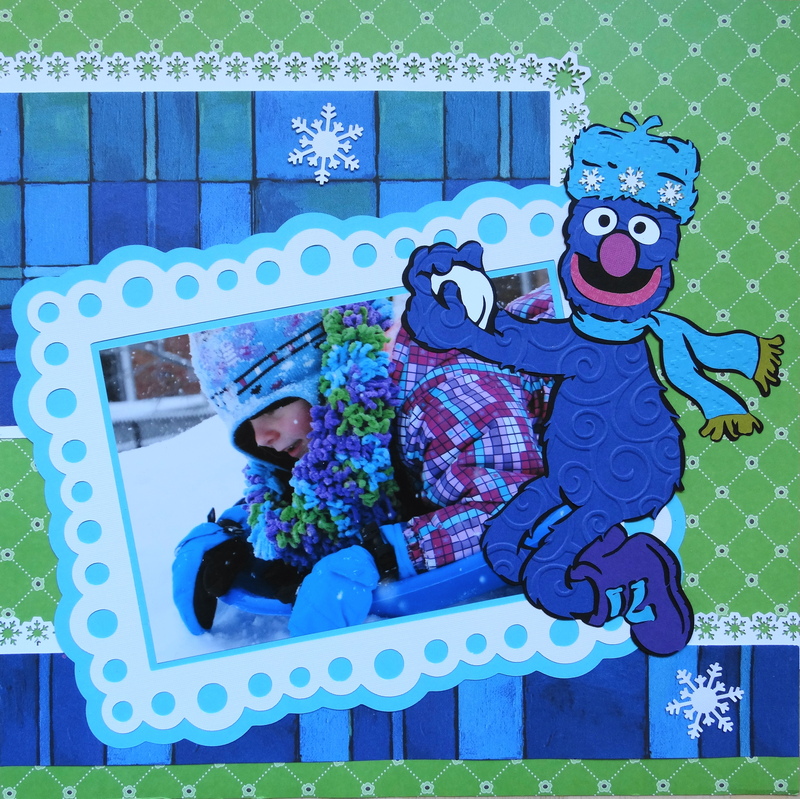 The snowmen are from Snow Friends. 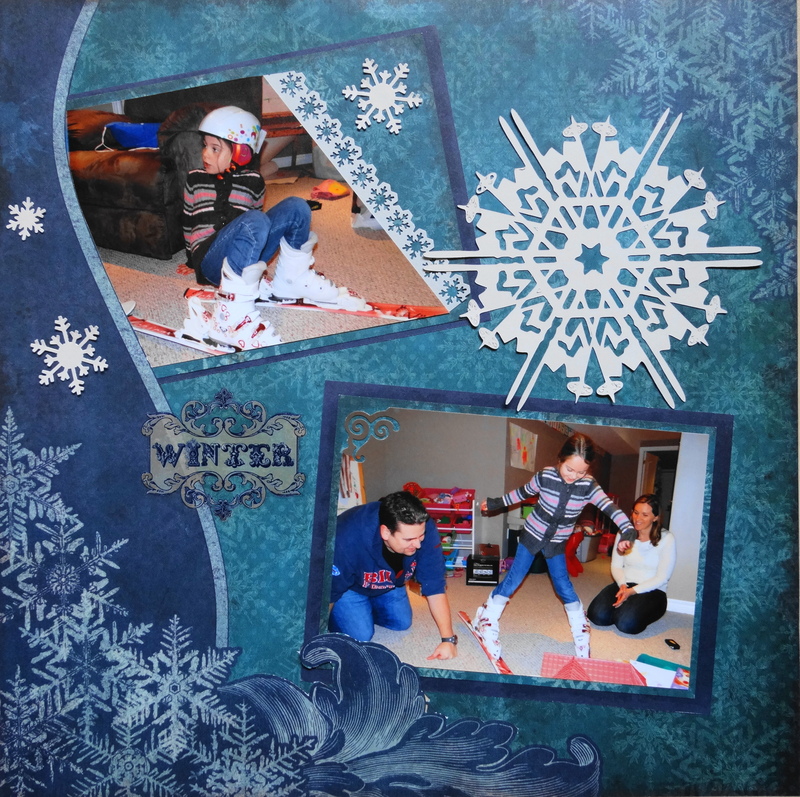 Inspiration: The first time we are able to spend Christmas with our son and his family at their home. 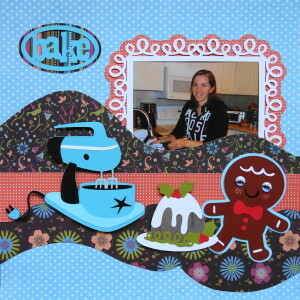 The scrapbook paper is from Colorbok Earthtones Paper Pad and American Crafts POW Glitter Paper. The mantle with candles is from A Quilted Christmas. 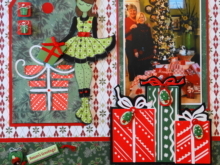 The stockings and the cute elf are from Jolly Holiday. 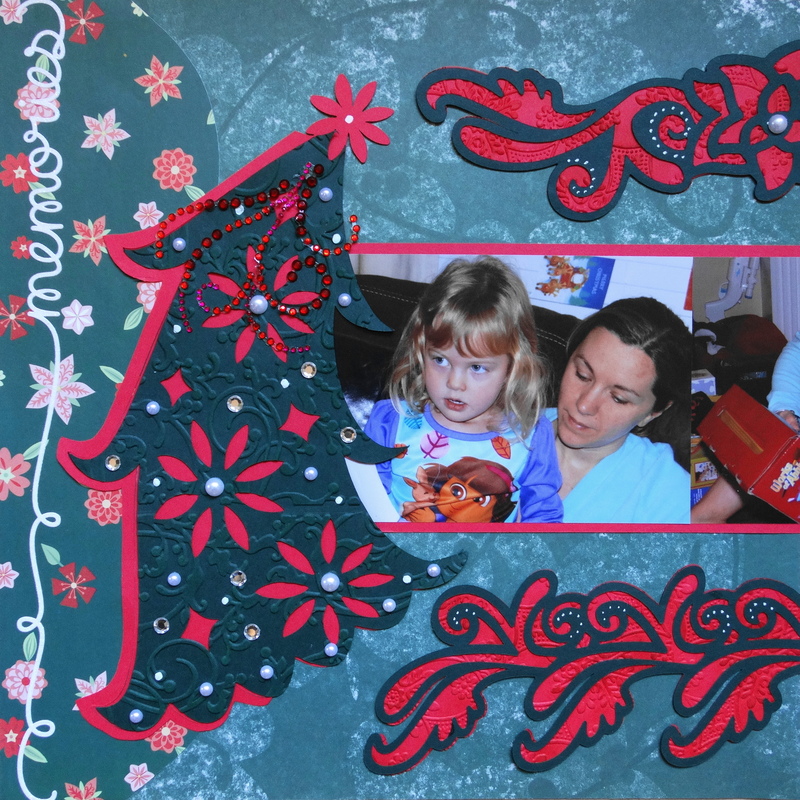 The frames are from Elegant Edges. 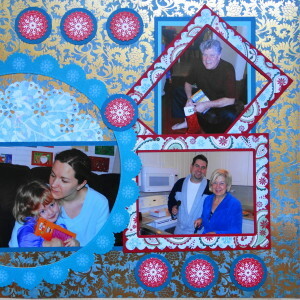 I used a Martha Stewart bubble bath punch to mat the border. 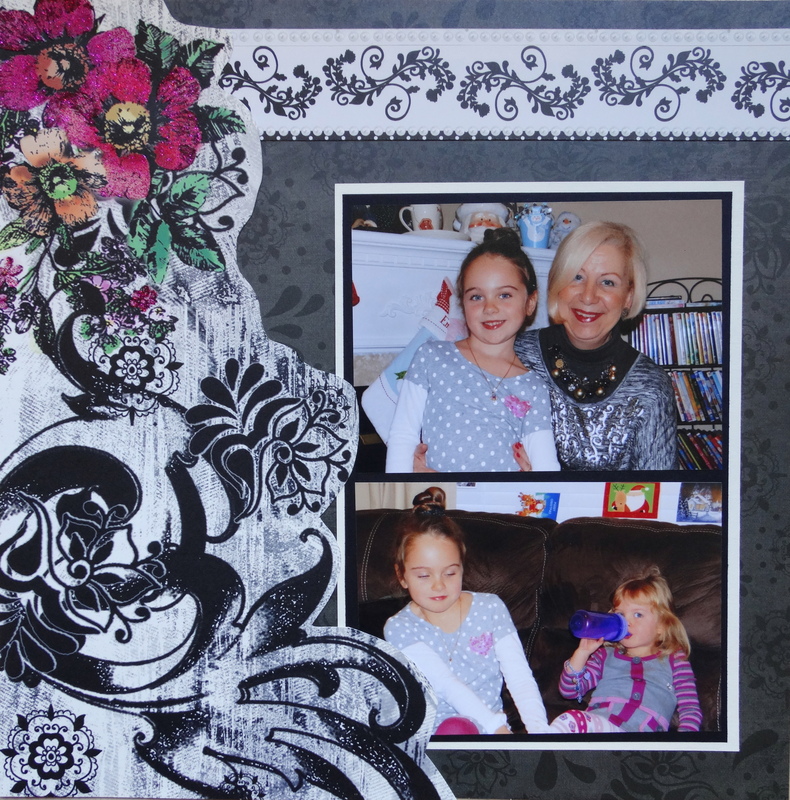 Inspiration: All the gray clothing on this Christmas Eve inspired a black & white paper selection. 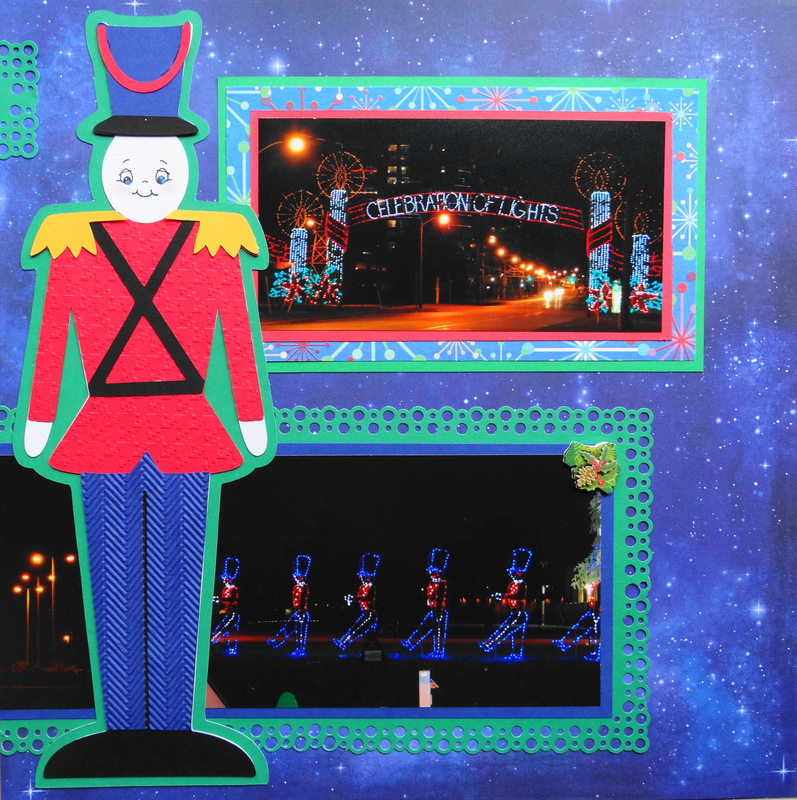 Inspiration: I was reading ‘Twas The Night Before Christmas to the girls on Christmas Eve so I wanted to create a scene on the rooftop from the book. 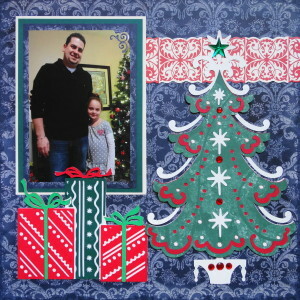 The scrapbook paper is from DCWV Midnight Berry Pad. 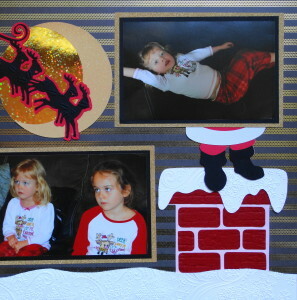 The reindeer is from Create a Critter and the chimney is from Simply Charmed. 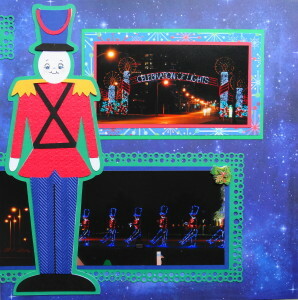 The Santa sleigh in the sky and moon are from Christmas Noel. The Santa feet on the chimney are from A Quilted Christmas. Inspiration: What a joy to be with my grandchildren on Christmas morning around the tree. 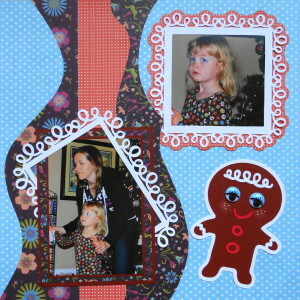 The scrapbook paper is from Imagine That Very Merry Paper Stack. The great tree is from Paper Trimmings. 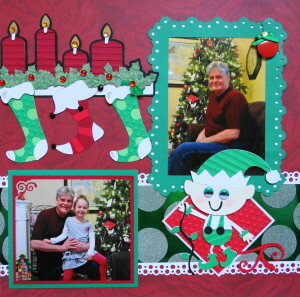 The top garland and the bottom border are from A Quilted Christmas. 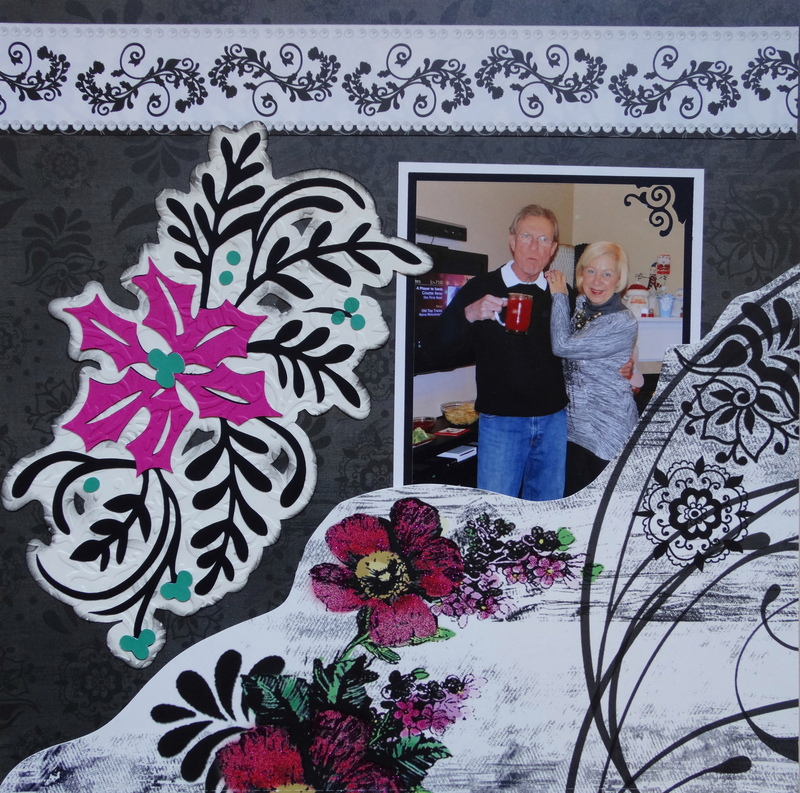 The bracket shapes are from a frame in Phrases and I used a Martha Stewart flourish lace border punch to make the white border. 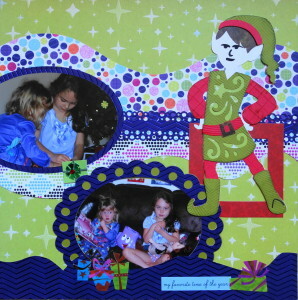 Inspiration: The purple pajamas and I wanted to use my new Christmas cartridge ‘Tis the Season so I went with the sleigh image from that. 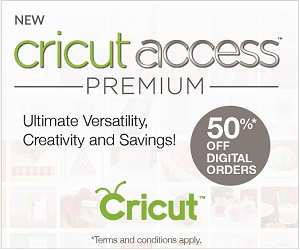 The background scrapbook paper is from American Crafts Studio Calico. 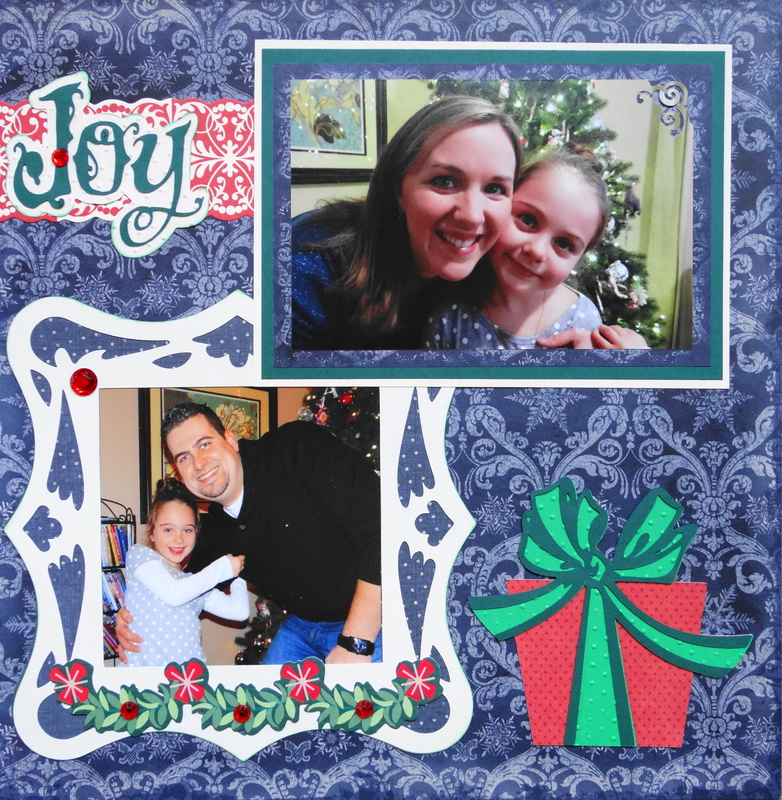 The dot diamond paper is from Paper Studio’s Girls Just Wanna Have Fun and the others are from Recollections Flora Festival. 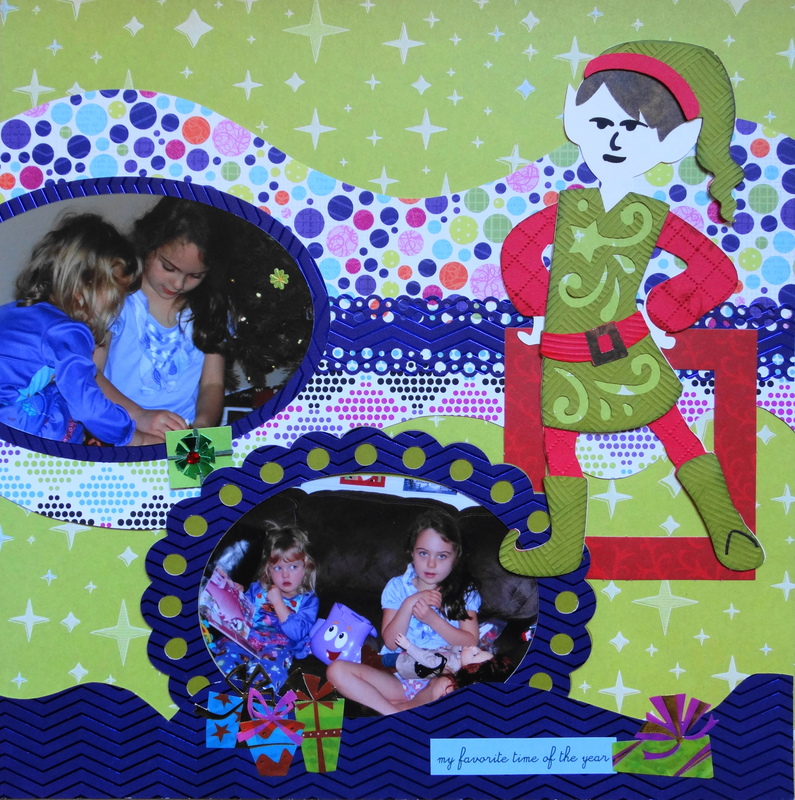 The sleigh is from “Tis the season and the elf is from A Quilted Christmas. 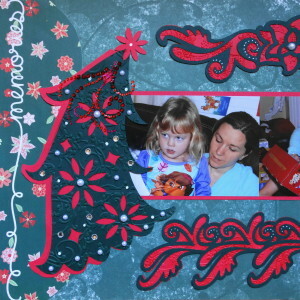 The scalloped frames are from Elegant Edges. 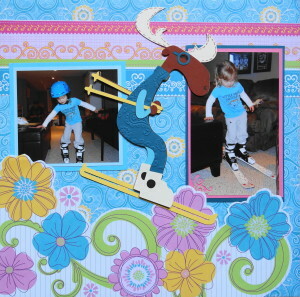 I used Kiwi Lane templates on this page. 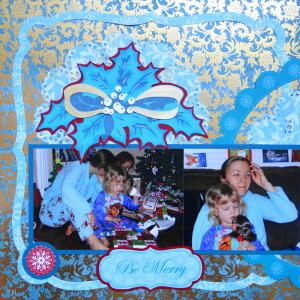 Inspiration: All the blue pajamas and robes on this Christmas morning. 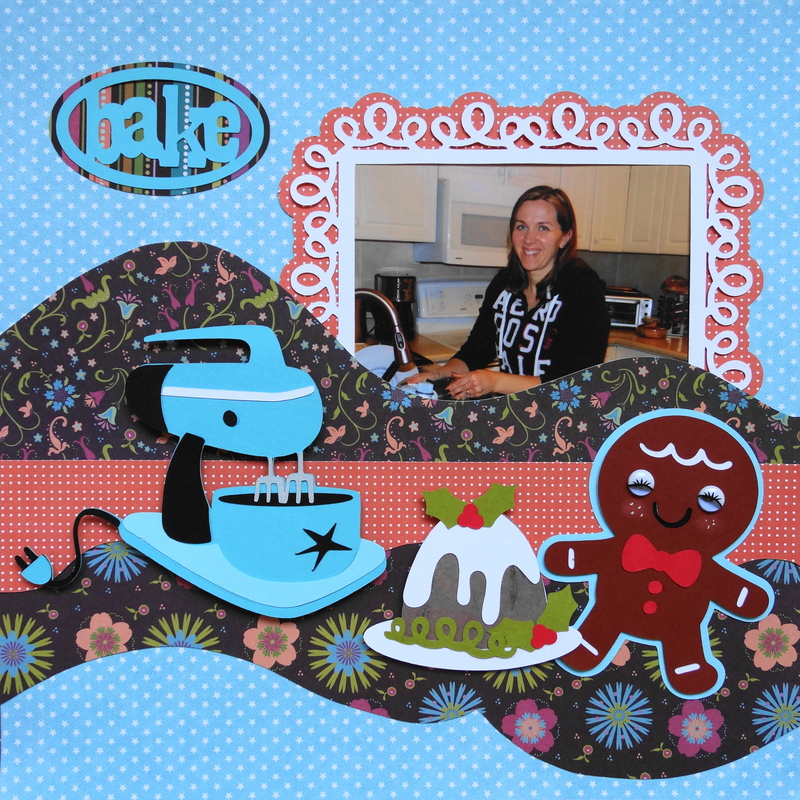 The scrapbook paper is from DCWV Far East Pad and the cutout shapes are from DCWV Holiday Specialty Diecut Stack. 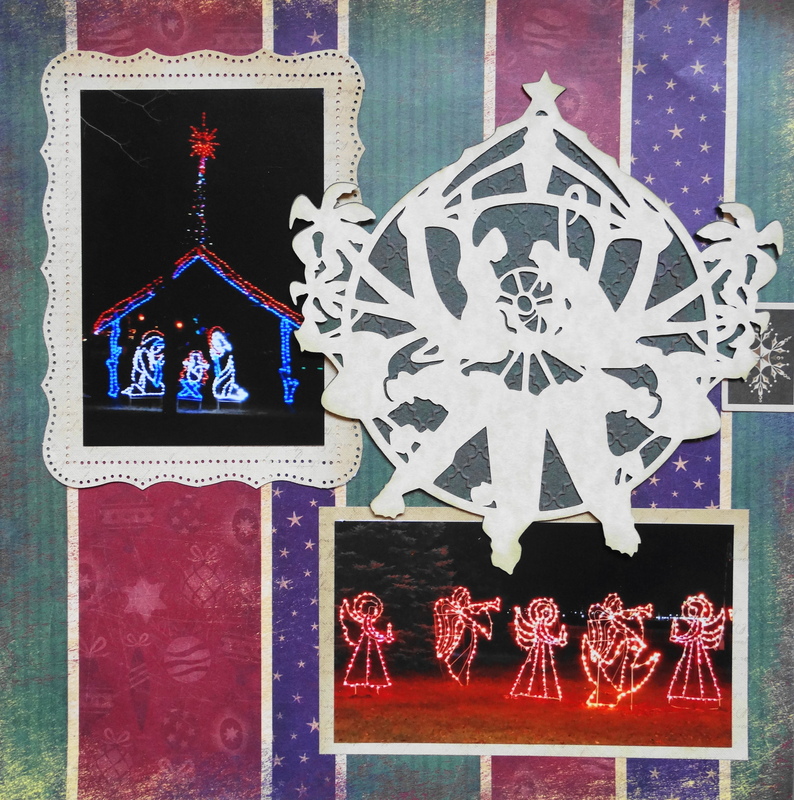 The holly spray is from Winter Wonderland and the circle behind it was made with a Martha Stewart eyelet doily circle punch. 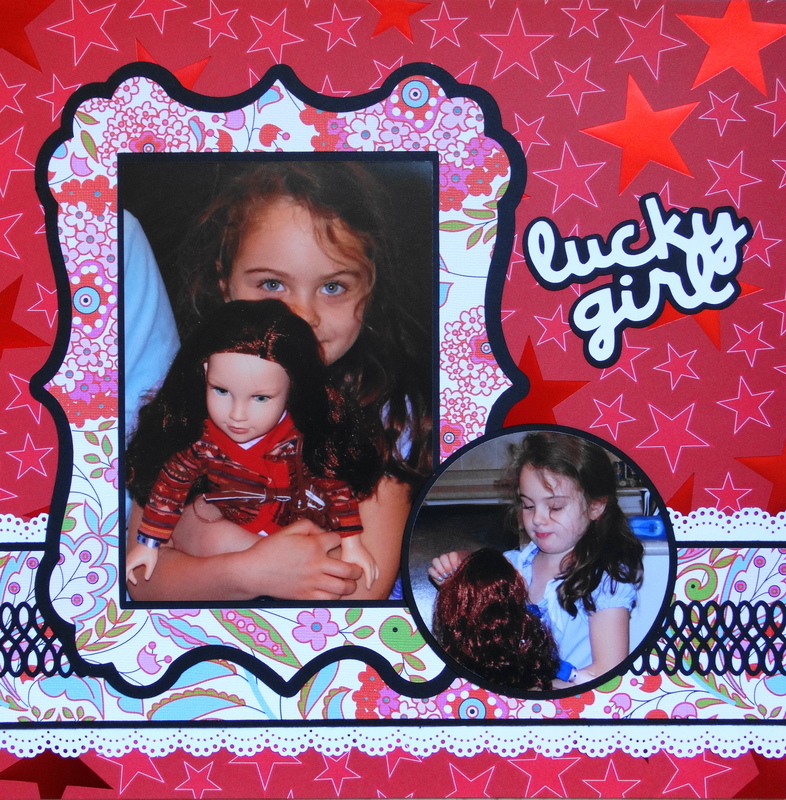 Inspiration: She asked Santa for this very special doll and is so in love with it. 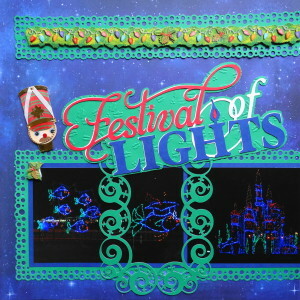 The paper is from Paper Studio Color Kaleidoscope. The frame is from Elegant Edges and the doll is from Christmas Noel. 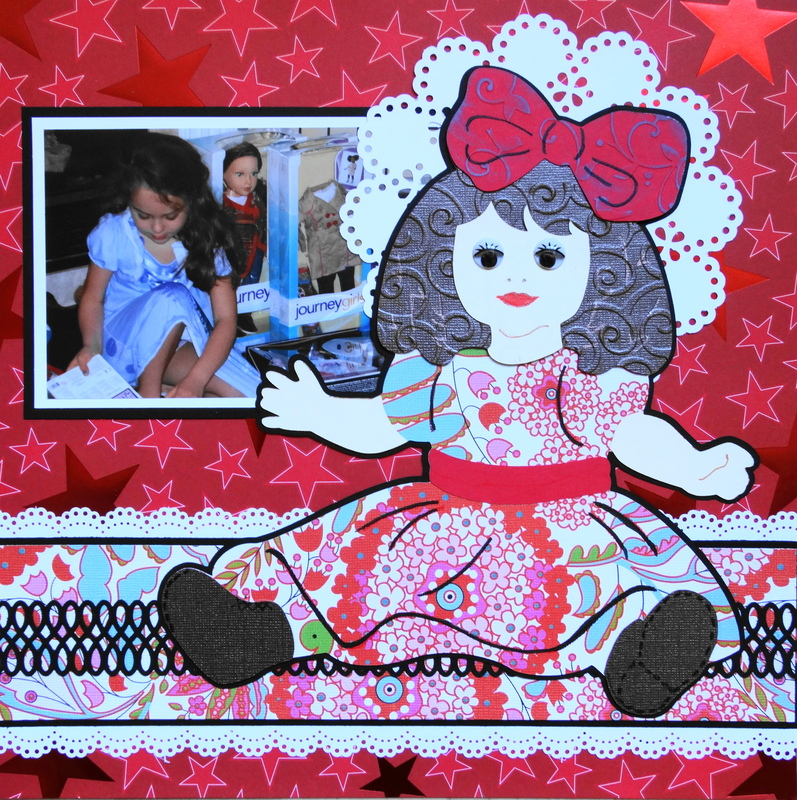 I used a Martha Stewart Lace circle punch for an accent behind the doll and the eyelet lace border punch on the border. 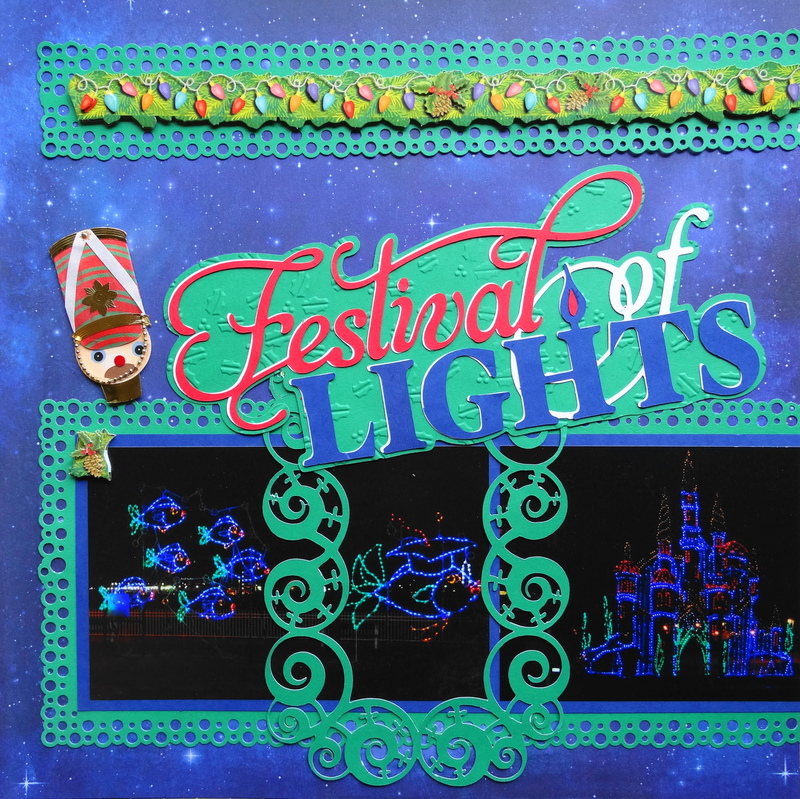 I also used the infinity loops punch to make the ribbon on the border. The title “Lucky Girl” is from the cartridge Paisley. Inspiration: The colours of the snowsuits and the fact that they are sledding. 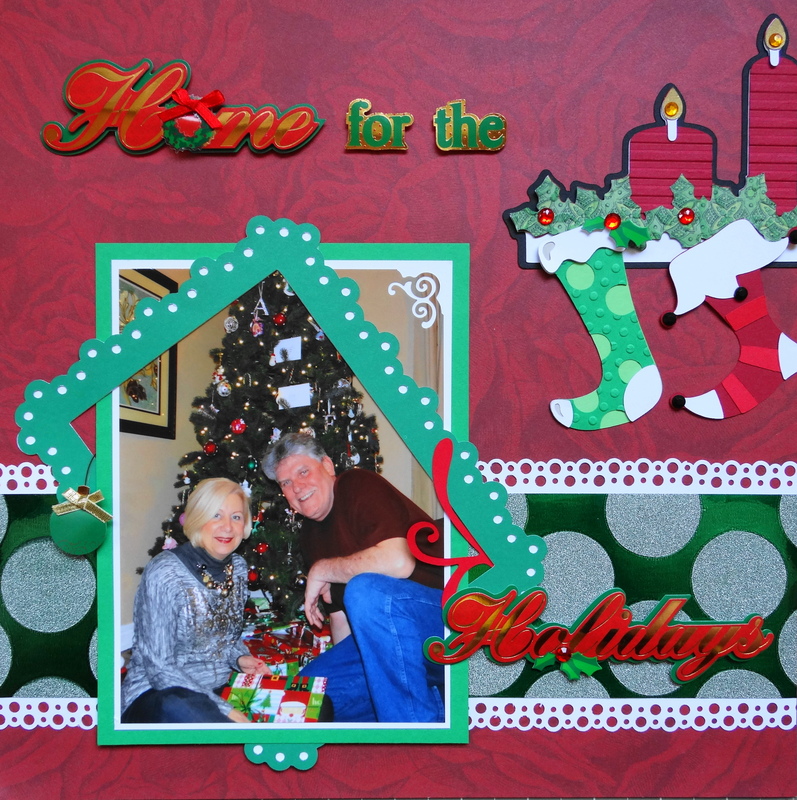 I used Kiwi Lane templates to create a hilly scene. The snowman is from Snow Friends. 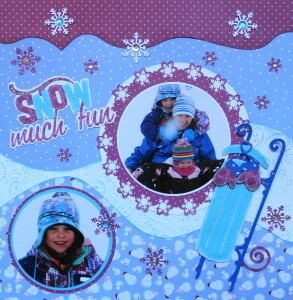 The sleigh is from Joys of the Season and the title “Snow Much Fun” is from Winter Frolic. The mittens are from Jolly Holiday. The frame is from Elegant Edges and I used a Martha Stewart Aspen Snowflake corner punch to make the round frame. The paper is old and I do not know where it was from. I embossed the white layer and inked it and glittered the snowman. Inspiration: I was watching my son and his children through the window while they were playing in the snow in the back yard, so I created that scene. 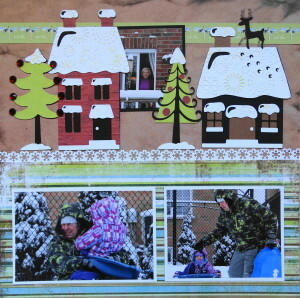 The colours of the brick houses inspired the paper choice. 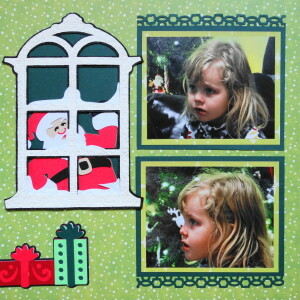 All of the houses and the trees are from Jolly Holidays cartridge. 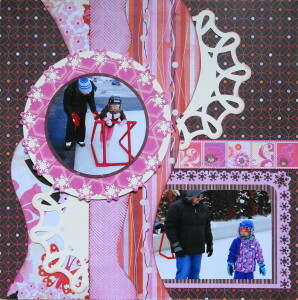 I used a Martha Stewart Aspen Snowflake border punch as a border trim. 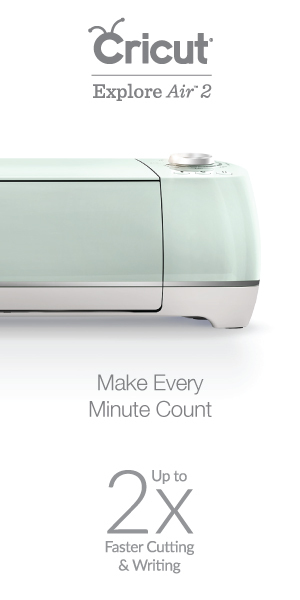 The houses are all 5 1/2″ and the trees are 4″. 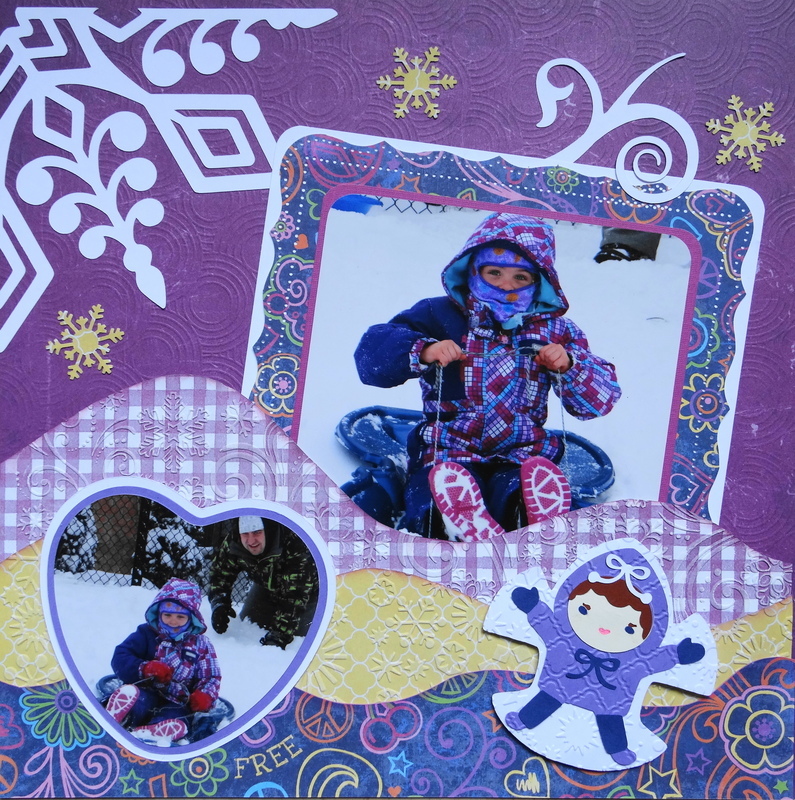 Inspiration: The colours of her scarf and the great photos of her sledding down the hill. 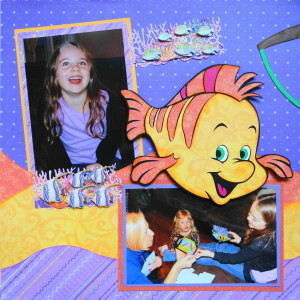 The scrapbook paper is from K&Company Brights Pad. 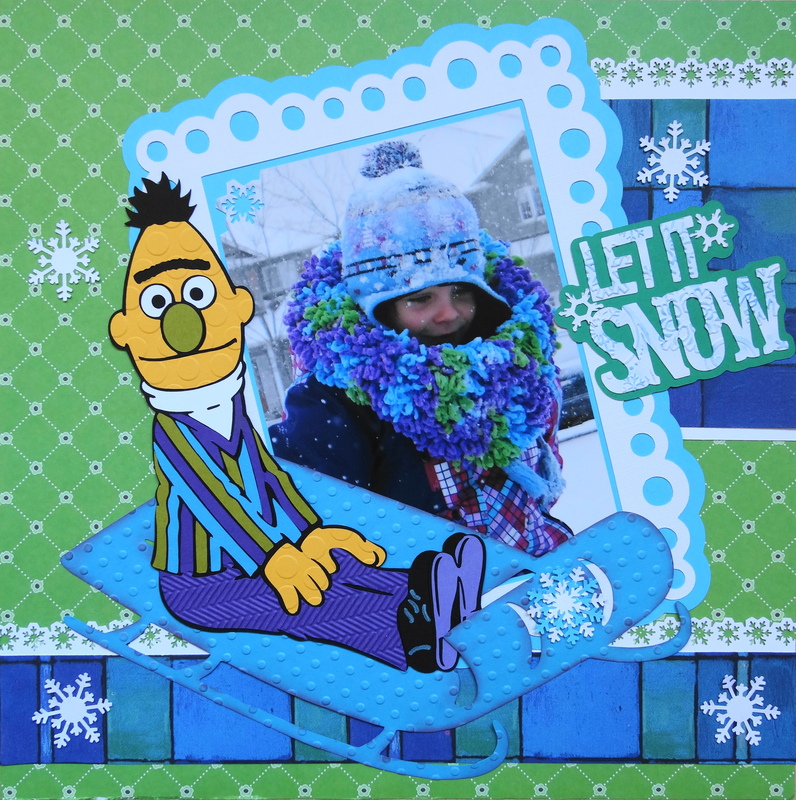 Bert (7 1/2″) and the sleigh are from Sesame Street & Friends. 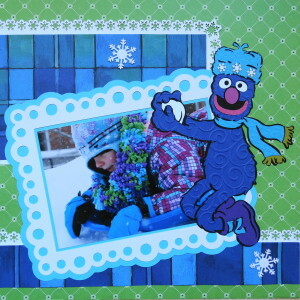 Grover (8″) is from Sesame Street Seasons. The frames (9″) are Dots 1 from Elegant Edges. 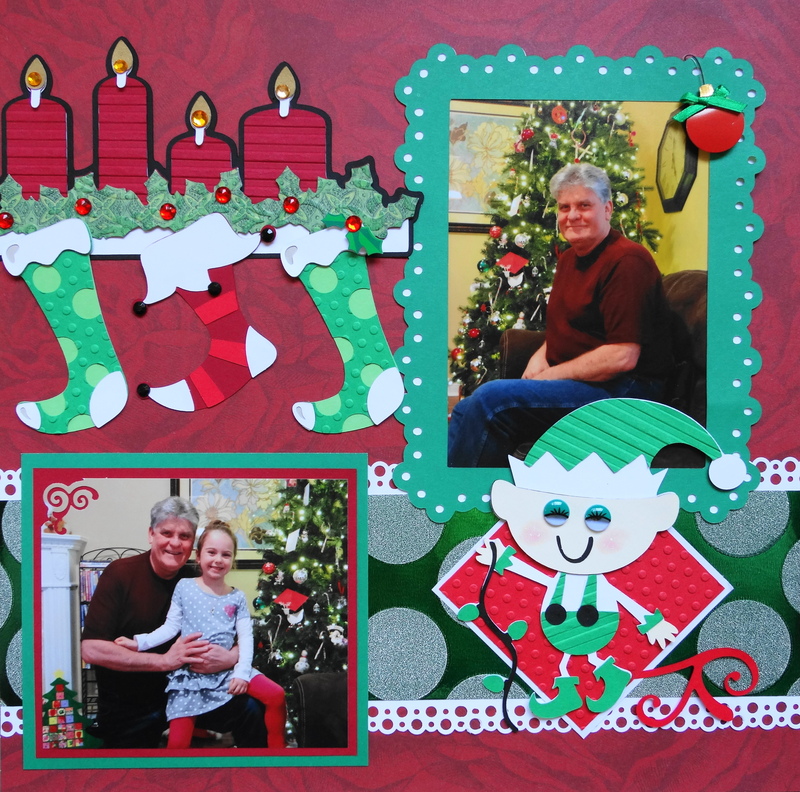 I used the Martha Stewart Aspen Snowflake border punch to trim the paper. Inspiration: The colour of his jacket and he is playing in the snow with the kids. 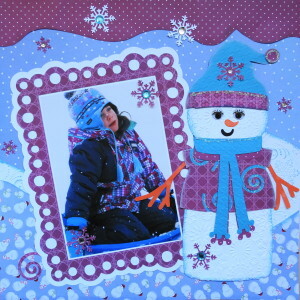 The snowflake paper is Creative Memories. 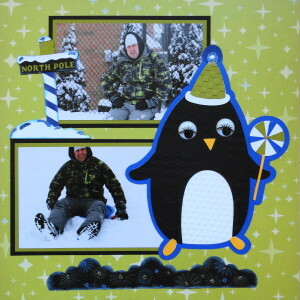 The penguin is from Winter Frolic and the title “Brrrr” is from Winter Woodland. The North Pole sign is from Jolly Holiday. The border, frame and background shape are the snowflake pattern from Elegant Edges. 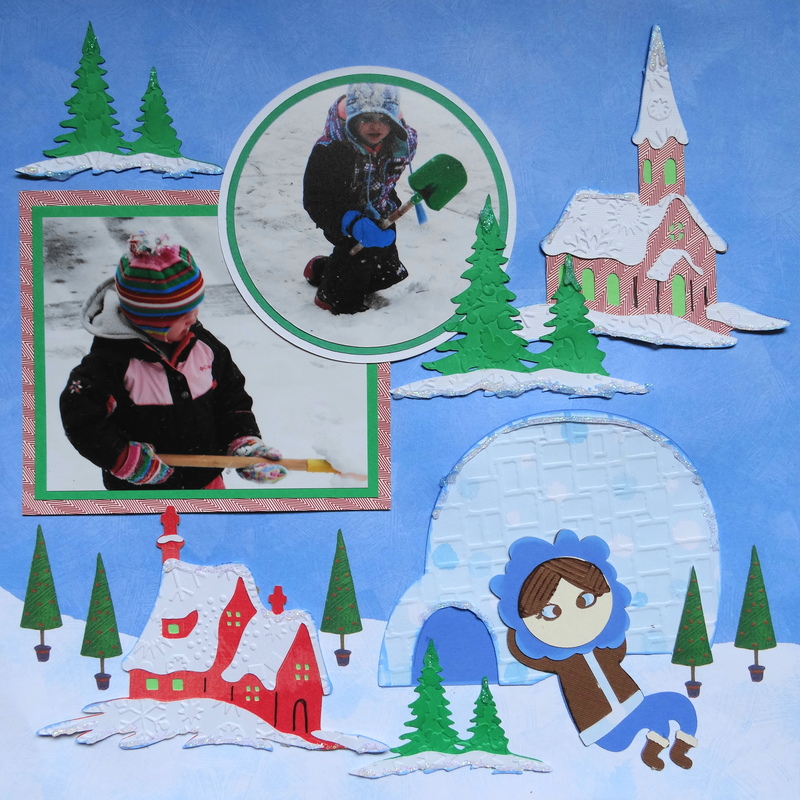 Inspiration: They are digging a snow fort, hence the igloo and then I just tried to create a winter scene. 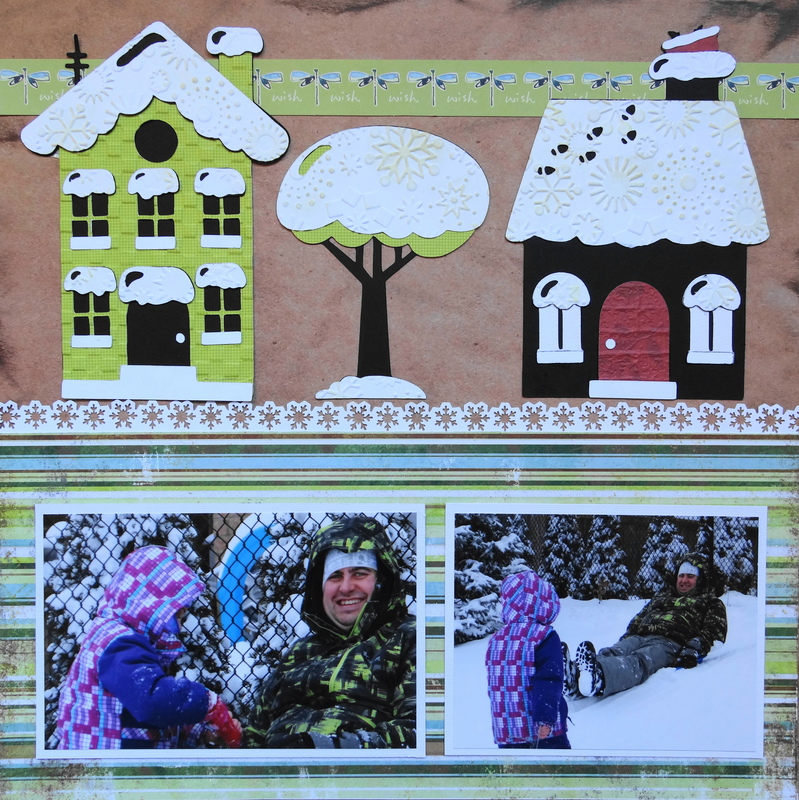 The churches and the houses are from Christmas Noel and the igloo with the child is from Children Around the World. The title Snow Lodge is from Go Canada. Inspiration: The stripes on her hat and I really wanted to do a title with the cartridge Speaking of Winter. 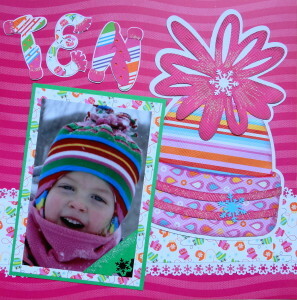 The background paper is from DCWV Neon Chic Stack. 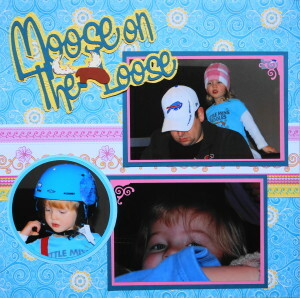 The mitten paper is from Recollections. The scarf is the letter L from speaking of Winter and so is the word “Smitten”. 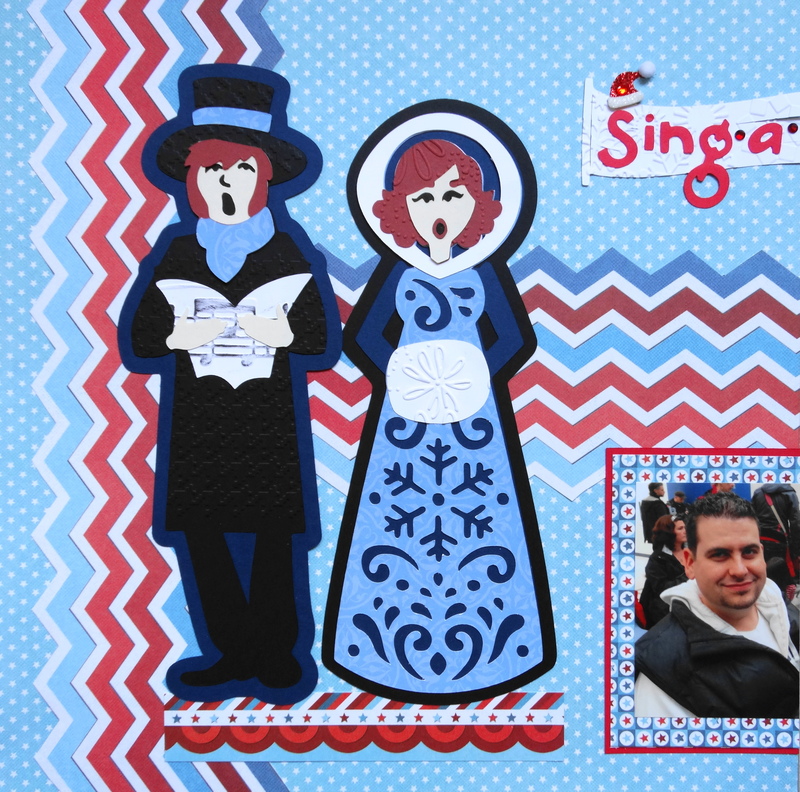 The hat is from Cheerful Seasons. I used a very fine point glue pen to draw the lines for the glitter on the pompom and I like the effect. I also used a Martha Stewart snowflake punch. 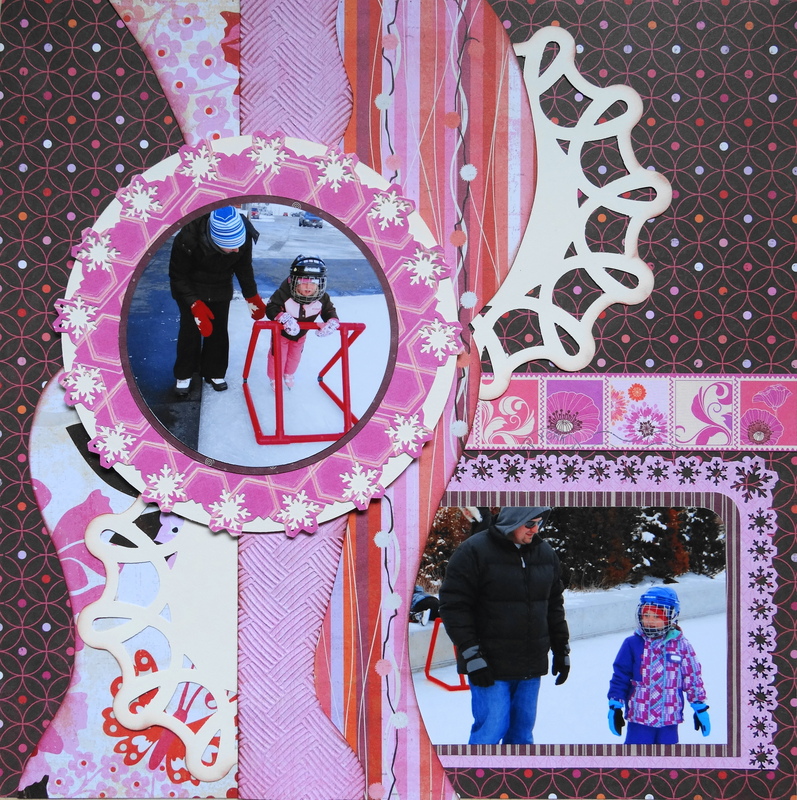 Inspiration: The pink and brown snowsuit and I wanted a Christmas theme. The scrapbook paper is from K&Co. Smitten Paper Pad and Artsy.licious Fine Glitter Paper. 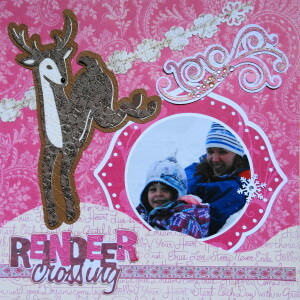 The title “Reindeer Crossing” is from Winter Frolic. 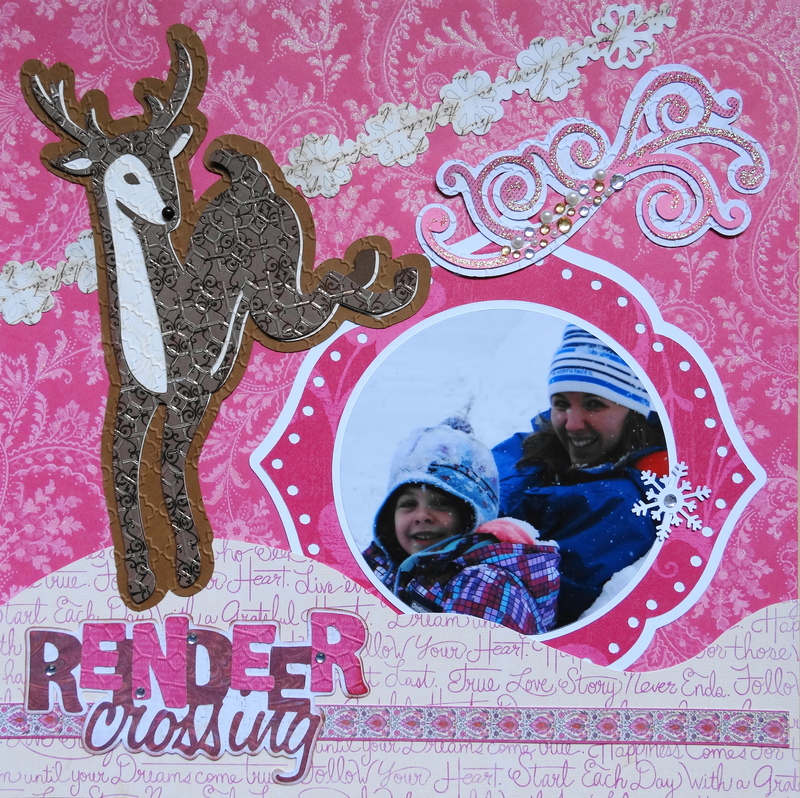 The reindeer are from Winter Wonderland and the flourishes are from Cheerful Seasons. 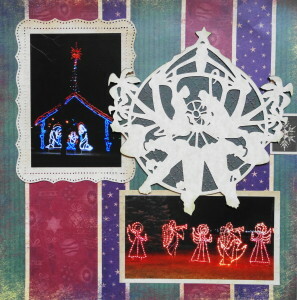 The snowflake grouping is from Winter Wonderland. 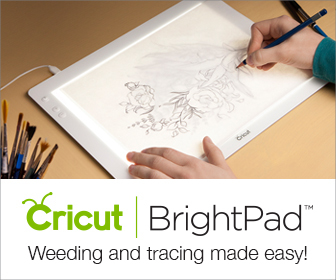 The frames are the clover design from Elegant Edges. Inspiration: She is going down the hill just like Big Bird. 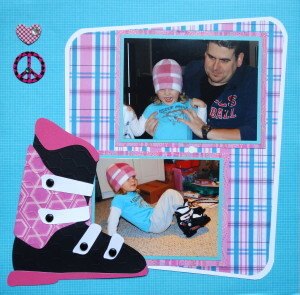 The scrapbook paper is from Creative Memories and DCWV Girl Power. Big Bird is from Sesame Street Seasons. 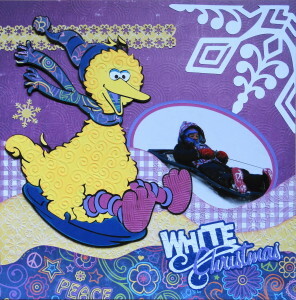 The title “White Christmas” and the snow angel are from Winter Frolic. 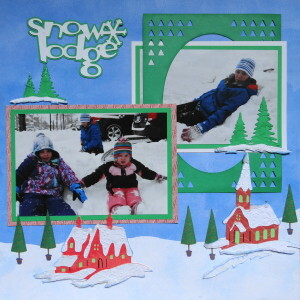 The large snowflake is from Pretty Pennants and the small ones are a Martha Stewart punch. 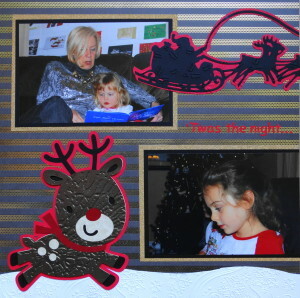 I used Kiwi Lane templates with this page for a hilly effect. Inspiration: The brown and pink snowsuit and learning to skate. The paper is Crate Paper Pink Plum Pad. 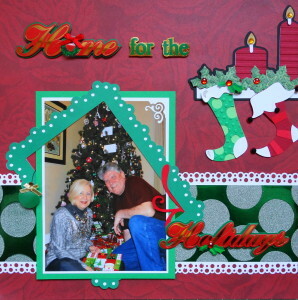 I used Kiwi Lane Madison Avenue templates and a Martha Stewart circle punch. The mother & child skating is from A Child’s Year and the title ” SK8 ” is from Create A Friend. 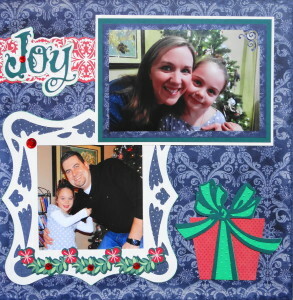 I used the corner snowflake punch to make the round frame on the left. 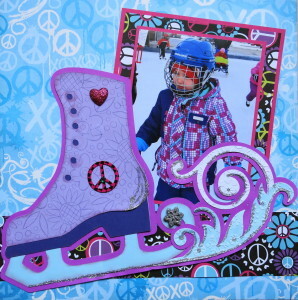 Inspiration: My granddaughter loves peace signs, so I chose this paper when I found a title with a peace sign in it. 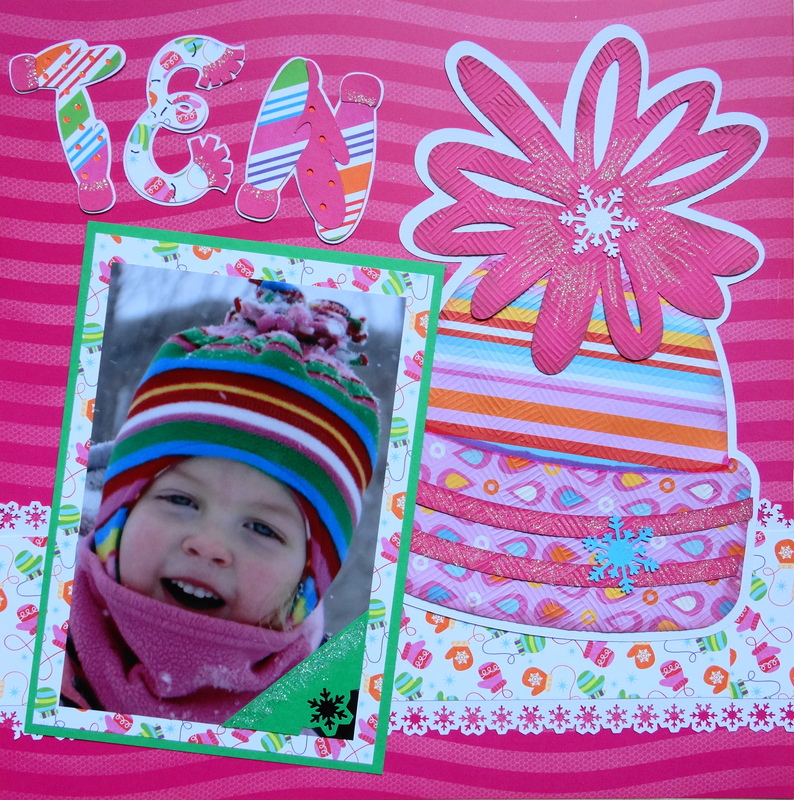 The background scrapbook paper is from DCWV Neon Chic Pad. 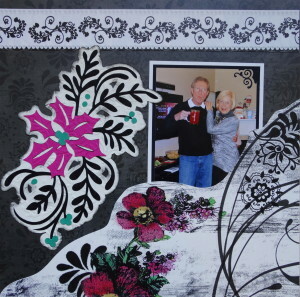 The black paper is from Paper Studio Girls Just Wanna Have Fun Stack. 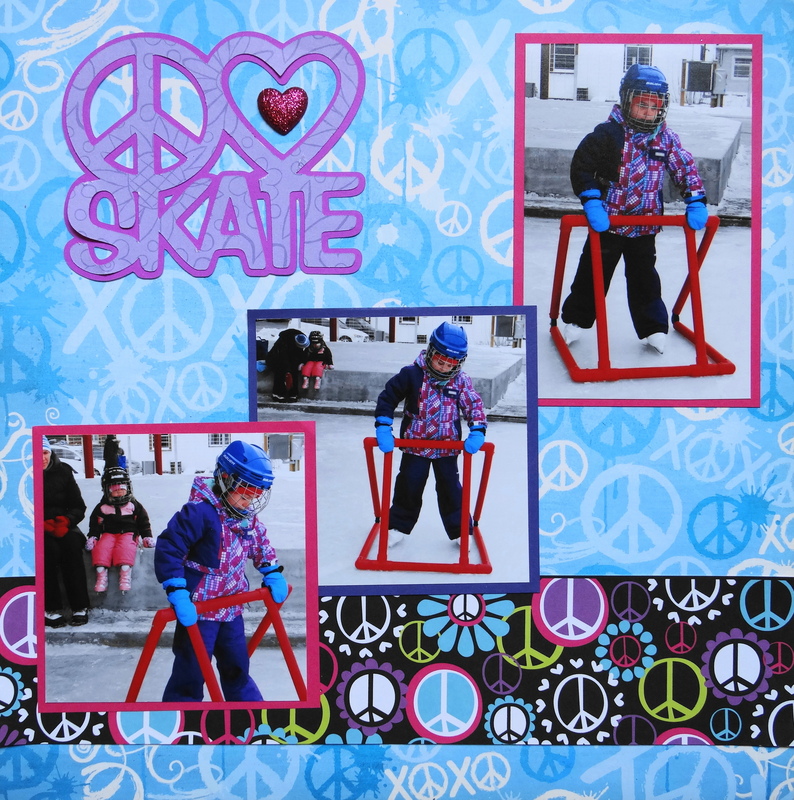 The title ” I Love Skate ” (3 1/2″) is from Go Canada. 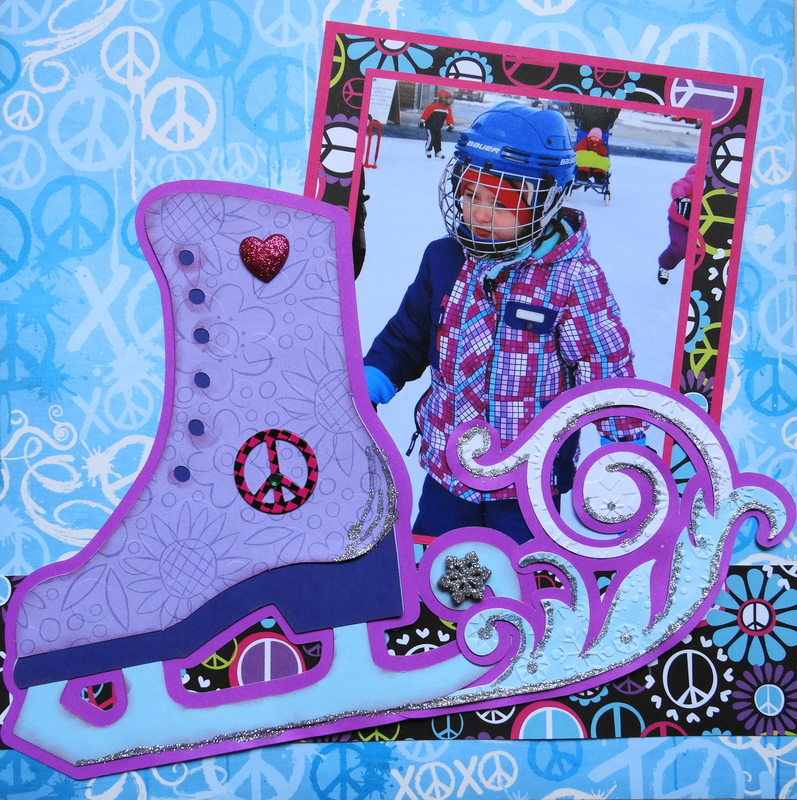 The skate (8″) and the flourish behind it are from Cheerful Seasons. 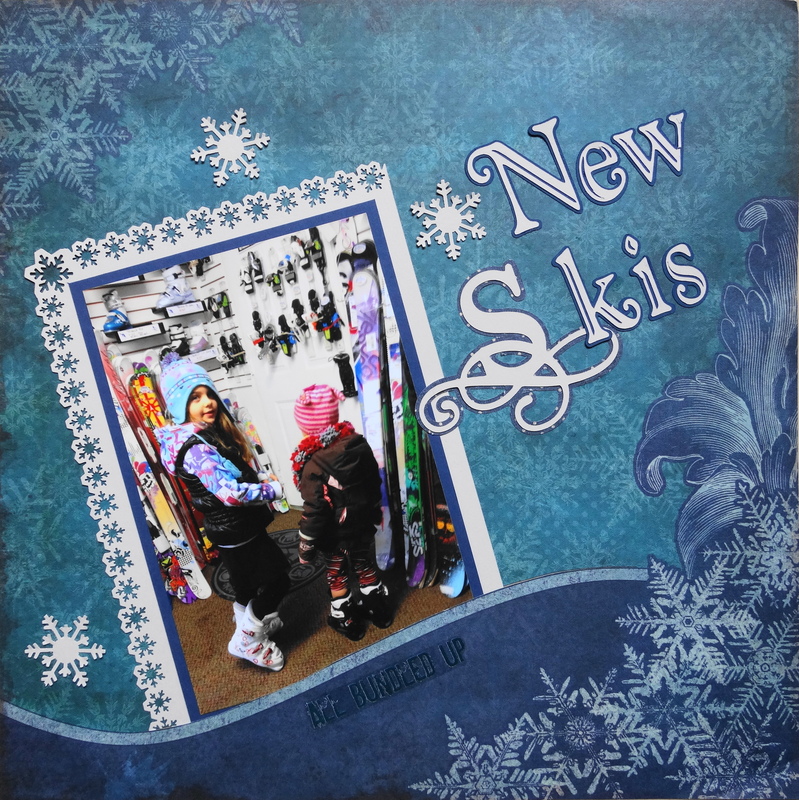 Inspiration: The large snowflake is actually designed with skis and ski poles, so I really wanted to use it. 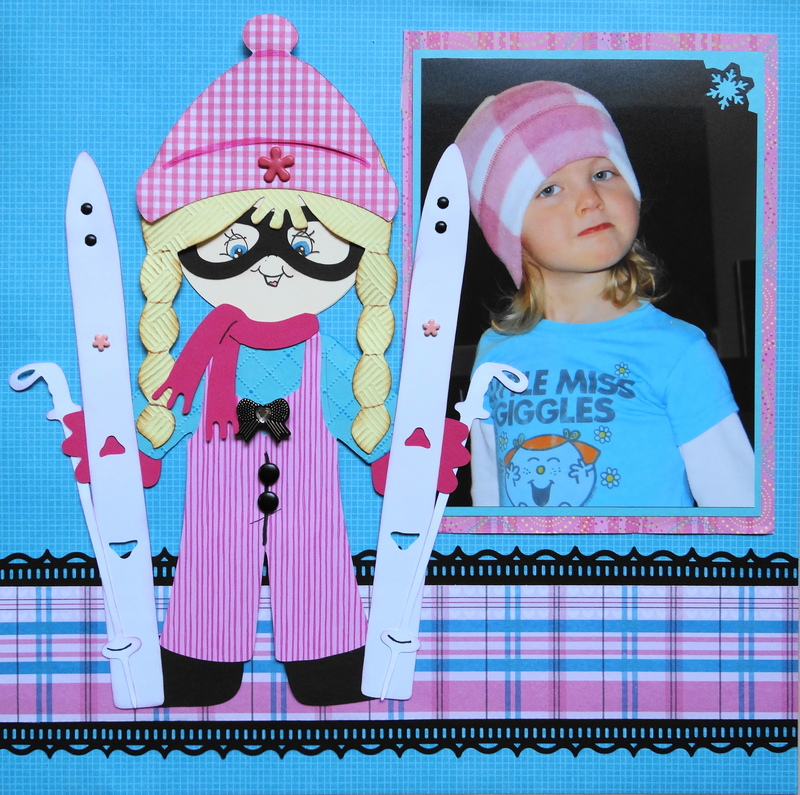 Inspiration: The pink hat and her new ski equipment. 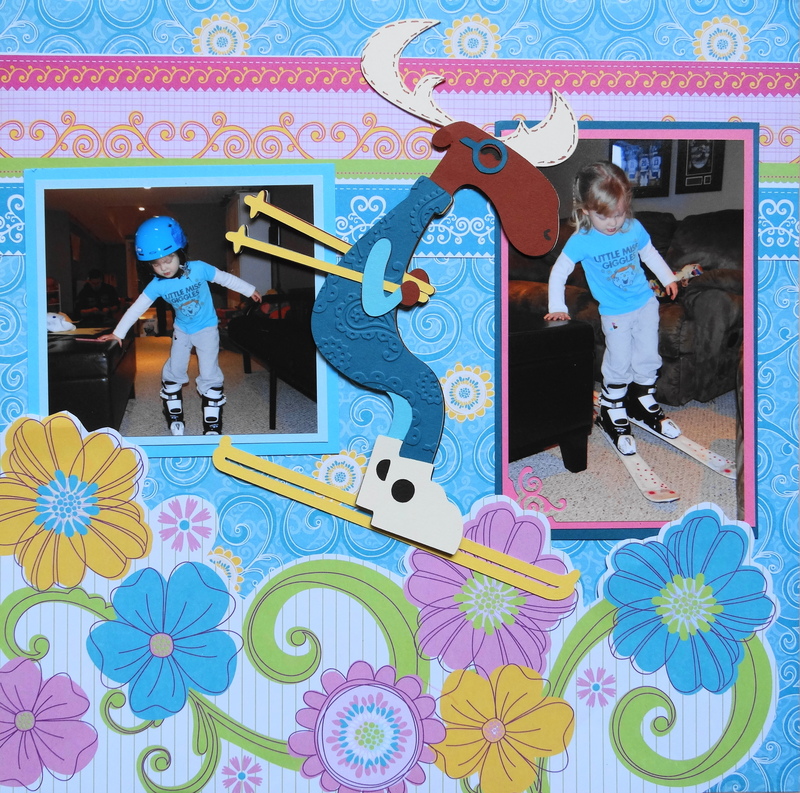 Inspiration: The turquoise top and she is trying out her new skis.